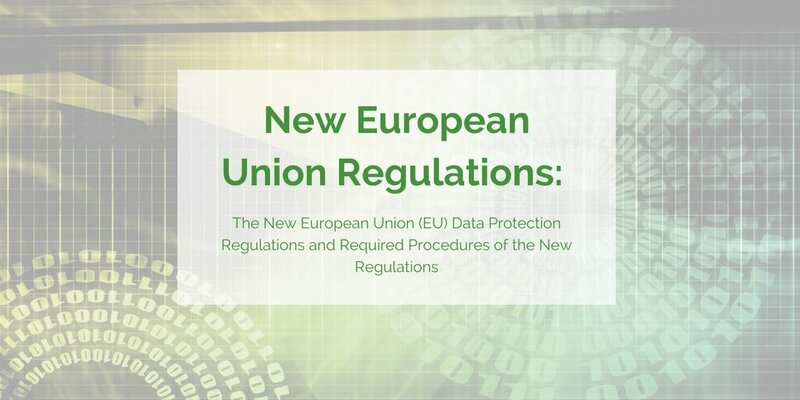 The objective of this document is to give a high-level overview of the new rules and regulations surrounding the newly passed European Union (EU) General Data Protection Regulation (GDPR). This new regulation is replacing the 20-year-old directive (95/46/EC). Keep in mind, by May 25, 2018, companies not in regulation or have a data breach while not in compliance will be fined up to 20,000,000 EUR or 4% of the total worldwide annual turnover of the preceding year whatever one is higher. The GDPR does not only require EU companies to be in regulation, but it also requires any business holding data about any EU resident worldwide to follow this regulation, this regulation protects even people in the EU that are not citizens. A company employing vendors must ensure the vendors are within regulation or both will be fined. And the Privacy Shield Certification no longer brings your business into compliance with the new GDPR. Even if sharing is allowed the new EU regulation prohibits personal data from being transferred outside the European Economic Area (EEA); Unless the data controller assures an adequate level of privacy protection. Ensure that if data is being stored on a cloud network that data is not being sent and stored in a foreign location or moved between facilities, this will result in a violation. Encrypting data before entering the cloud can protect you, showing that the controller took the necessary steps to “meet the individual’s reasonable expectations of data privacy” in the case of data loss. People can now request that his or her data be erased if: The data is no longer useful or being used in the matter that it was originally collected for. If the information owner has withdrawn his or her consent. If the person objects to the collection or processing of his or her personal data. Or if the organization processing personal data is not in compliance with (GDPR). How Does the New EU Data Protection Regulation Impact Companies? For companies holding information about individuals that may reside or be citizens of EU, this new directive will directly affect the information security side of the business. Their vendors as well as them self must be in compliance or will obtain substantial fees in the event of a data breach. Policies and procedures need to be updated to match the regulations and required procedures of the new regulations and ensure processes are taking place.